At Savannah Court of Camilla our activities program specifically designed for seniors is second to none! From creative and fun classes, arts and crafts sessions, to in-house musical performances, and educational seminars, there is so much to choose from at Savannah Court of Camilla. Our staff will get to know your likes and dislikes and will keep them in mind during the preparation of activities. Every month, residents, friends and family are invited to the themed event with live entertainment and an assortment of delicious food. Outside activities are part of our lifestyle so we provide opportunities to spend a day on the town, or enjoy a group outing with other residents. 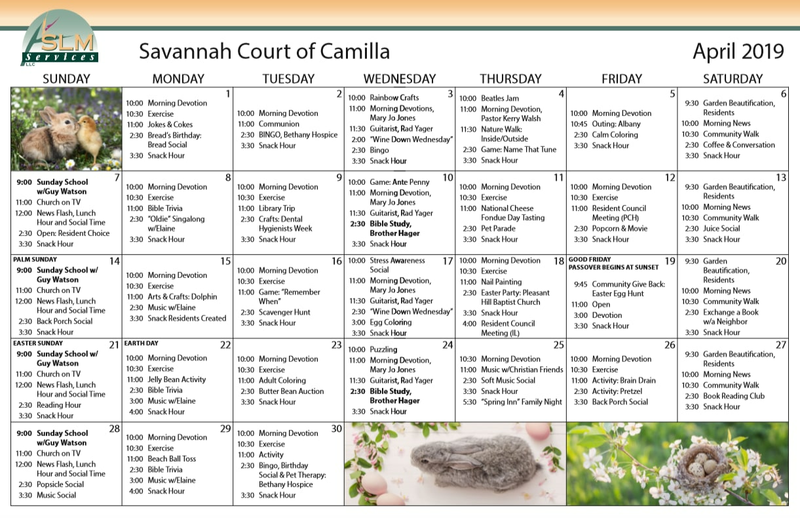 The newsletter and activities calendar are published monthly and distributed to all residents, family members and friends of Savannah Court of Camilla. Our activities program is vibrant and full of many choices for the residents. From arm chair stretch and flex exercise classes, to social gatherings, to educational seminars, and to lots of fun and exciting events, there is something for everyone to enjoy. Please contact us today if you would like to be placed on our mailing list.